The Request: I received this request from friends after bragging about wonderful the Pear Honey that I picked up at Tisdale, Kansas Methodist church supper and sale. It was so wonderful that for several years we timed our annual trip to Kansas to be at the same time as the church supper. After much searching, I found recipe that is quite close to the Pear Honey we use to buy. One recipe is from the same area where the church is located. I’ve seen some Pear Honey recipes that are more like a butter. But the Pear Honey from Tisdale has chunks of pear in it. If you have a Pear Honey recipe, please share it with me! Peel, core and quarter (smaller pieces if you want) pears. Add 4 pounds of sugar and 1 cup of vinegar. Let stand overnight to draw out the juices. In the morning, drain the juice into a large kettle. Add the remaining 3 pounds of sugar and cinnamon stick, broken up. Bring to a boil and add the pears. Reduce heat and cook slowly about 2 hours or until the syrup has a light reddish (honey) color with a little bit of shine to it and pears are transparent. Pack into hot jars and seal. Process as your would for any preserves. It’s the color that gives this recipe it’s name. 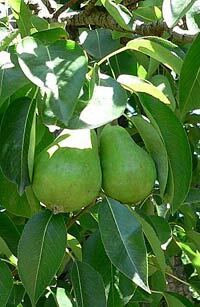 If you have an abundance of pears, check out Aunt Flossie's Pear Butter.